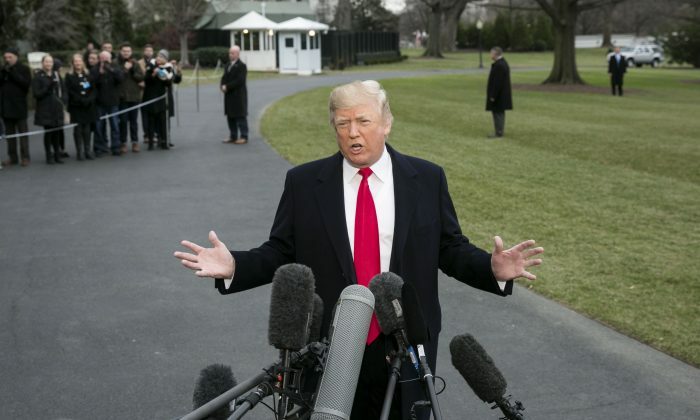 President Donald Trump brought up removing White House press credentials from “Fake News” media after a report showed evening news coverage of his presidency on network television has been overwhelmingly negative. All while his approval rating has been improving. Of the 1,601 “explicitly positive and negative statements” about Trump by reporters on ABC, CBS, and NBC evening news, 90 percent were negative between Jan. 1 and Apr. 30, according to Media Research Center. Legacy media outlets have maintained primarily negative reporting on Trump’s presidency since its beginning. An analysis of more than 3,000 stories during the first 100 days of his presidency across 24 different media organizations found that reporting on Trump has been the most negative compared to other presidents over the past 25 years, according to Pew Research Center. The research shows that only 5 percent of media reporting during the first 60 days was positive. Negative stories were 62 percent, and 33 percent were neutral. Yet, in recent months, Americans increasingly like what Trump is doing. His job approval rate has climbed from the 30s to 40s in recent months, with Reuters/Ipsos poll over 48 percent on May 2— the highest in 12 months. Particularly among black people, Trump’s popularity more than doubled recently, from 11 percent on April 25 to 25 percent on May 3. Whats more, he is now close to hitting 50 percent approval among independents. Trump commented on his improving ratings during his May 4 speech at the annual National Rifle Association meeting. That same day, Trump rebuked NBC News after the network backpedaled a story about Trump’s lawyer that was based on anonymous sources. “NBC NEWS is wrong again! They cite ‘sources’ which are constantly wrong. Problem is, like so many others, the sources probably don’t exist, they are fabricated, fiction! NBC, my former home with the Apprentice, is now as bad as Fake News CNN. Sad!” Trump stated in a tweet. Trump has said multiple times he doesn’t consider all media untrustworthy. “I have to tell you, there are some great professionals too in that world,” Trump said during a round table on tax reform in Cleveland, Ohio, on May 5. But he’s repeatedly called some of the largest left-leaning outlets—CNN, NBC, CBS, ABC, The New York Times, The Washington Post—Fake News. In fact, he’s used the phrase “fake news” 196 times in his tweets, according to the Trump Twitter Archive. The Republican Party even announced the “Fake News Awards” in January, listing 10 examples of news stories, some of them with major implications, that turned out to be wrong or outright false. The Epoch Times’ Jasper Fakkert contributed to this report.